5:00 a.m.—David Breashears, Jangbu Sherpa, Pete Athans, Ed Viesturs, and David Carter left Base Camp this morning for what will be their summit attempt on Mt. Everest. They slipped out of camp silently in the darkness and entered the Khumbu Icefall for the last time this year. They will move directly up to Camp II today and assess the weather from their well-stocked "Advance Base Camp." All will be climbing together, along with New Zealand expedition leader, Guy Cotter, Tashi Tenzing, Tenzing Norgay's grandson, and Finnish climber Veikka Gustafsson who is climbing Everest this year without the aid of supplemental oxygen. This is thought to be the strongest team of climbers on Everest this year, with 15 successful summits of Everest between them: (Ed Viesturs four times, Pete Athans four times, David Breashears three times, Guy Cotter two times, Jangbu Sherpa one time, and Veikka Gustafsson one time). As they moved off into the blue ice pinnacles of the Icefall, crossing a frozen pond in the early morning light, all were in good spirits and ready to get up on the mountain. Most of the other Everest expeditions are resting at Base Camp and waiting for the high winds on the summit to dissipate. "We're fairly certain that there are no teams ahead of us on the mountain," said David Breashears before leaving. 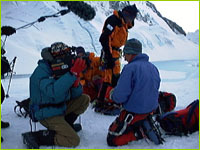 For David Carter, this is his second attempt on Mt Everest; he made an unsuccessful attempt in 1991. His anticipation for what lies ahead confirmed our own trepidations for what may happen this week. Carter couldn't have put it any better: "I'm psyched, I'm edgy, and I feel the need to get going. Mentally I'm ready, physically if I stand around too much longer I'll lose that edge. I even admit I'm scared. I don't know what to expect. I feel I'm in a good mental state because I don't have 'summit fever' and I'm in control of my feelings." Within three-quarters of an hour the climbers appeared as no more than tiny dots on the jumbled glacial horizon that stretches up toward the top of the Icefall. Watching them climb higher toward Camp I was difficult for us, as we know this will be the last we see of them before they head into the thin air above Camp IV. There, at 26,000 feet, we will be conducting psychometric tests on them with and without oxygen. Regular pulse oximeter readings will be taken and reported to us at Base Camp and the expedition doctor, Howard Donner, will be keeping close communication with them as they move toward the summit.